Keepa is great tool that, when used correctly, can provide you with the vital information you need to make smart sourcing decisions. We use Keepa throughout each day as we work on our Amazon FBA business, whether it’s out sourcing retail arbitrage, at home doing online arbitrage or wholesale research, or in repricing our inventory. Toward the end of this blog post I’ll show you a video walking through how to understand these graphs directly on the Keepa website. 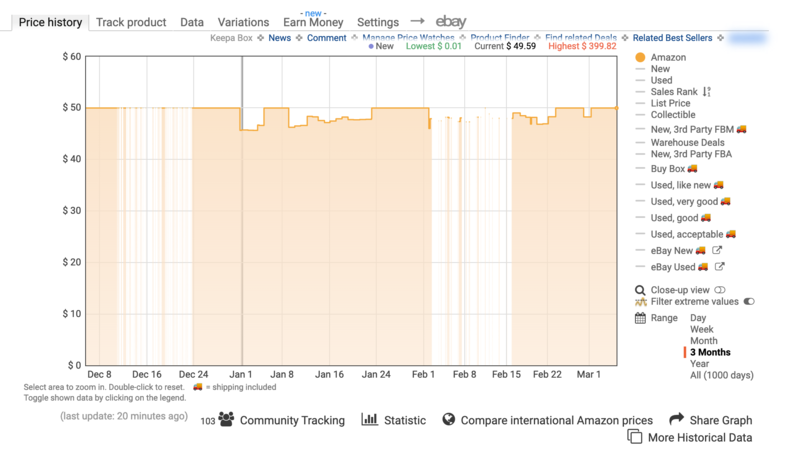 Take a look at a Keepa graph for a product on Amazon. At first this graph can look like nonsense – just a lot of blue, black, and green squigglies with some orange and white shading thrown in. But all of these colors and lines will make sense to us shortly. Under the first four lines of the Keepa key there are many more data options you can choose to view, which can be very helpful, but for right now, we’ll focus on reading and understanding the data from these first four lines (Amazon, Marketplace New, Marketplace Used, and Sales Rank). 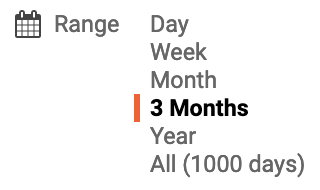 Below this key, there’s a list of date ranges where you can select the period of time you wish to look at: day, week, month, 3 months, a year, or all the data Keepa has ever tracked on this item. Along the left side of the graph are dollar amounts, with the lowest amount at the bottom and the highest at the top. Along the bottom of the graph are the dates you have selected for the graph, with the most recent date on the right and the oldest date to the left. Along the right side of the graph are the sales rank numbers, with the lowest at the bottom and the highest at the top. You can click to remove each of the sets of data in the color-coded key to the right of the graph. If you click Amazon, Marketplace New, Marketplace Used, and Sales Rank, you’re left with a plain white graph with no lines or shading. If you click to add back the Amazon data, now you will see orange shading that indicates when Amazon has had the item in stock. If the area is orange, Amazon is in stock. 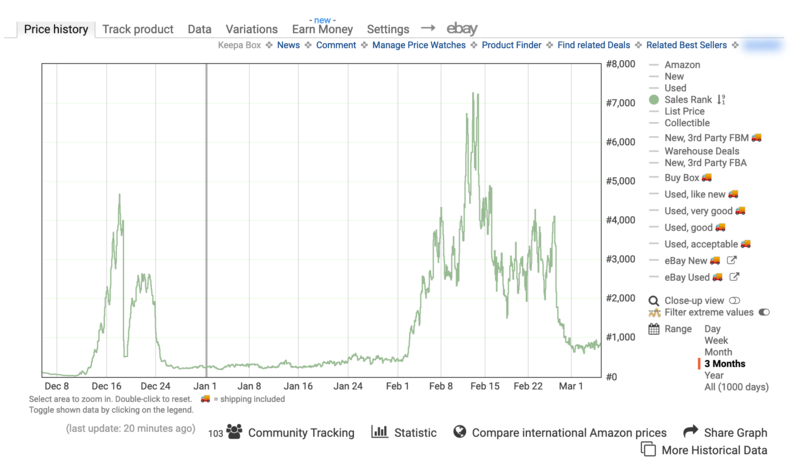 Wherever you see white gaps on the graph, Amazon is out of stock. If you click on the different date ranges you can have Keepa display how often Amazon is in or out of stock on the item. Now, if you click the orange circle to remove the Amazon data and click the green circle to bring up the sales rank data, then you’ll see a green line come up on the graph to show the changes in sales rank over time. Notice that the higher sales rank number is at the top of the graph and the lower sales rank number at the bottom. BIG TIP: Any time the sales rank number moves from a larger number to a smaller number indicates at least one sale has occurred. Sometimes the improvement in sales rank means multiple sales. There is not a way to know for sure the algorithm for how Amazon sales impact the item’s sales rank, but the more sales the item gets over a recent time period, the better (lower) the sales rank number gets. If you move your cursor over the the graph, you’ll see small boxes that pops up near the cursor to tell you all of the data (that you have activated on the Keepa key) at that particular point in time. Around the cursor, you can see Amazon’s price, the Marketplace New price, the Marketplace Used price, and the Sales Rank. At the bottom, there will be a box that shows you the date that the data is from. As you slide your cursor across the graph, you can see where the price and sales rank goes down or up over time. I can’t imagine my Amazon FBA business without using Keepa on a daily basis. Right now, the pricing history for Keepa is free, but the sales rank (and some other vital data, like buy box history) is included in a minimal paid subscription. For more information on how to sign up for a subscription to Keepa, click here. Be sure to check out this screen capture video we made to show a basic walk-through of how Keepa works. The video is a few years old, but is still very applicable to Keepa today. Also, don’t forget to subscribe to the Full-Time FBA YouTube channel for notifications when we add new videos (very often). I plan on updating the video below soon, so bookmark this page if you want to come back and see the updated video when I do that. This blog post and video only scratch the surface on what is possible with Keepa. I only showed you how to read and understand 4 data points, but Keepa has so much more that can help you make the smartest sourcing decisions for your Amazon FBA business. I want to encourage you today if you’re making sourcing decisions without using historical sales rank and pricing data from Keepa — there is a better way to buy Amazon FBA inventory! You can make smarter sourcing decisions. Your business will hugely benefit if you take the time to learn how to use Keepa the right way. 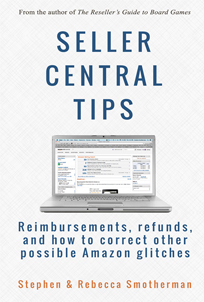 To find out everything there is to know about using Keepa to make smart sourcing decisions, be sure to check out our course, The Reseller’s Guide to How to Keepa Camel: Using Amazon Sales History to Make Smart Sourcing Decisions. This course is a combo ebook and video course where I walk you through everything you need to know to make sense of Keepa in ways you’ve never thought of. How about you? Do you use Keepa? What is your favorite thing about Keepa? I’d love to hear from you in the comments below. 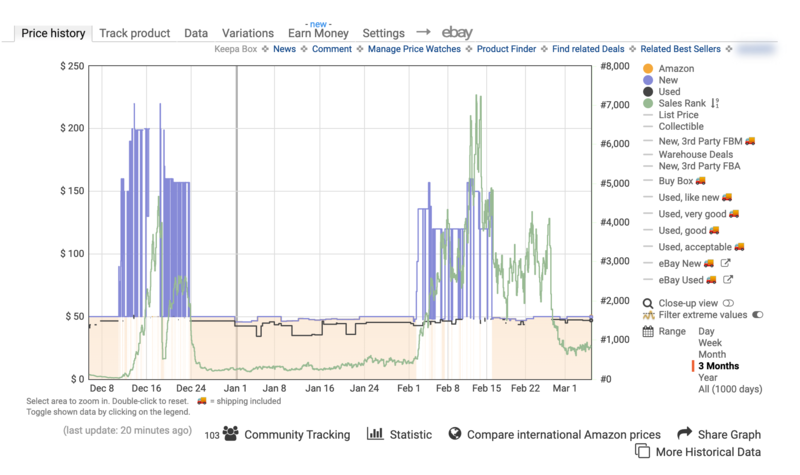 Re: ‘CamelCamelCamel – notice that the higher sales rank number is at the top of the graph, lower number at the bottom. 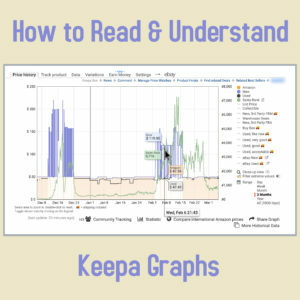 Instead of an uptick in the graph to indicate a sale (like on CCC), the Keepa graph has a dip in the graph to indicate that the sales rank has lowered when a sale occurs. Be sure you make the mental shift on the sales rank graph when you go back and forth between CamelCamelCamel and Keepa.’ You can click the sales rank green dot/arrow to switch Keepa’s sales rank green line to the same configuration as CCC. You are a good teacher Stephen. I appreciate your detailed, easy to follow explainations in your CCC and Keepa videos. Now that I have a better understanding of how to read the graphs I hope you will follow up with examples of your thought process regarding whether or not to buy an item based on graph info. Many thanks for the informative well done videos. I would love this also. Are they in your other tutorials Stephen? Thanks! I think Keepa is light years ahead of CCC. I used CCC for years but don’t even look at it anymore. The customization features on the left on Keepa are so much more rich than what CCC offers. The interactive ability of the Keepa graph, I could go on. If Keepa charged $500 a month it would be to my disadvantage not to pay for it. That’s how valuable it is. Thankfully Amazon pays Keepa as an affiliate, otherwise Keepa could very well go the route of a paid model, a very attractive one I might say. Jennifer, thanks for the update. Yes, right after I filmed this video, I found out that Keepa added this option. But thanks for helping others to know about this cool update. I was looking at that and wondered what it was. Thank you for the update! Question about rank chart that you make available to your blog readers for free. There are top tiers expressed in percentage that show us whether product’s BSR falls within range to help our sourcing decision. Do we use current product BSR or average of last 6 months (a year?) to determine what tier our product falls within? Thanks. I compare the average sales rank with my free sales rank chart. Can you please explain the statistics feature in the plugin specifically what is the dROP? The statistics give you more info on the item’s sales and price history. Drops are usually seen as sales, though it can sometimes also be multiple sales. So I understand that drop amount shows minimum sales. The 1.7 drops is how many times Amazon dropped the price. You need to look at the sales rank drops to see the estimated minimum number of times the product sold. When I’m typing this, it’s 95 per month for this item. Hope this helps! If the item is in the top 1% in regards to sales rank, then it becomes a whole different way of reading the data. The movement from a higher sales rank to a lower sales rank means multiple sales. No way to know exactly how many, but the closer to #1, the more multiple sales are going on. All clear, but how do i know that any product that i am interested in is at 1% or 3% or 5% of the market of the particular category? Means, in what way we can combine that information with sales rank? keepa graph are an indications for a sale. I see a lot of times that Amazon will share the buy box with a third party seller and even with an FBM . 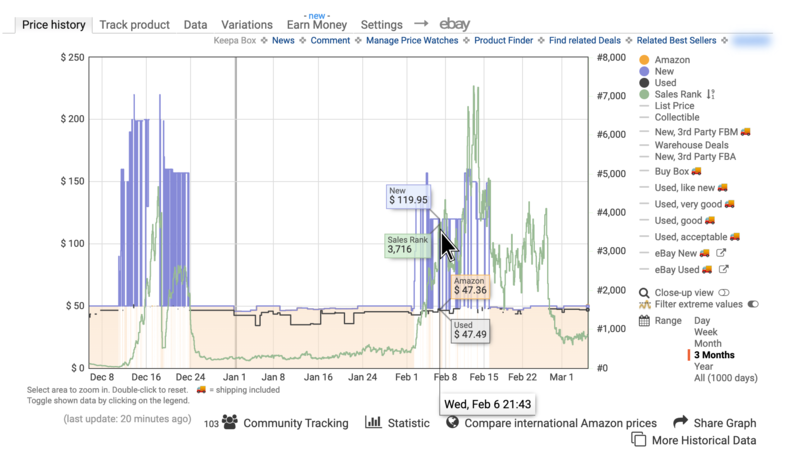 Are there a way to read in the keepa graph whether Amazon historically shared the buy box ? There is nothing on a Keepa graph that indicates a sale. It’s just what the price was at the time Keepa grabbed the current low price. The red triangles is the low price for 3rd party FBA at that time… the blue boxes is the price for a 3rd party merchant fulfilled price at that time. And the only way to know if Amazon has shared the buy box is if you can see on the chart that Amazon is in stock (with the shaded area) and that there is a purple diamond that indicated a 3rd party seller has the boy box. Some purple diamonds say that it’s Amazon in the buy box. Hope this helps! I am trying to figure out the meaning of DROPS. If I open the statistic and read the column SALES RANK. St the bottom there are a line called DROPS. What does it mean. Sometimes say 123, another time said 3.7 What do this numbers mean? Drops are simply the number of changes from a higher to a lower value, e.g. from 10 to 9. Originally they were thought to be a quick metric on how often prices drop (sales rank did not have a drop value at first). Eventually, Keepa did add it for sales ranks as well, though it is vastly misunderstood. A drop in sales rank does not equal 1 sale, but most people do not understand how sales ranks work and consequentially misinterpret the drops number as well. It’s a helpful number but nothing exact. Hope this helps! Is there a way to calculate or see actual (or close) sales numbers for a particular ASIN with any of these tools? Do you mean number of sales? Not with any accuracy. Some tools guess, but they are just guesses. I am a newbie and started doing RA/OA this month. Thank you Stephen for sharing valuable information! is your course ideal for online sourcers Stephen? Im not living in the US. Yes! 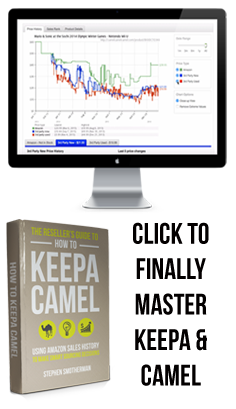 I use both Keepa and CamelCamelCamel with my Online Arbitrage sourcing. And both Keepa and Camel have online extensions you can add to your browser to make Keepa and Camel even better! Hello, What does it mean with an item has been around for a while ex. 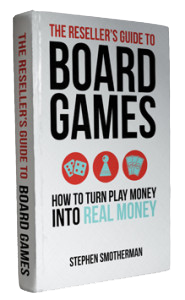 365 days and has not sales rank. It has a buy box. Hey Stephen! I just came through your website and keepa tool. I have subscribed for free trial, and it shows almost every information I was looking for. On the Keepa graph, I was just not able to understand diamond, square box and pyramid triggers. Do these triggers indicate occurring of sales or anything else? Because I can see multiple triggers at same price in a series of time, so I assume its not the entry of a new offer or shifting of buybox, it is actually something else. I will appreciate your response. Thanks ! These do not indicate sales, but prices in a moment in time. Depending on the shape, it means different things. Play around with the key to the right of the graph where you can turn on and off all the data. Click on the colored circles to turn on or off the info you want to see. Then you can see what each shape means for that moment in time. Again, it’s not sales, just the data at that point in time. Hope this helps! Ok. I understand that it’s not sale. But the point is why do they appear when there is no change in information? For example this ASIN: B01DVS3X56, If I set range to week, and select BuyBox option only from the right panel, it shows 4 diamonds from March 11 to march 13. and when I click them it gives exactly the same information, like BuyBox winner name and their price, which is Amazon itself at $57.38. I am unable to understand what triggers these diamonds to appear? As there is no change in information. It should have appeared again only if the BuyBox winner was changed or the price at BuyBox was changed. Help me understand it. A few thoughts that I hope bring some clarity. Keepa tries to track all the buy box changes, but since the buy box can change so very often (as it rotates between multiple sellers) then Keepa just goes into check and record the latest info from time to time to best help us sellers. For lower ranking items, they go check the buy box info more often than on higher ranking items (that probably doesn’t change that often). The buy box can change multiple times a day, and it would require a lot of Amazon API requests (which costs them more) to get this info consistently. If Keepa tracked 100% of buy box changes, there is almost no way they could graph that on lower ranked items as it would be data overload. So Keepa does their best to give us a good idea of what’s going on at the time they take the buy box snapshot. Sometimes this info is the same, like in your March 11-13 time period, but sometimes it’s different, like looking at the recent March 13-19 time period.